Features bracket for full-sized PC cases. For mini-sized PC case bracket, see model 111 0352. Where there's no space for a desk, put the computer on the wall using the ZIOTEK track system. 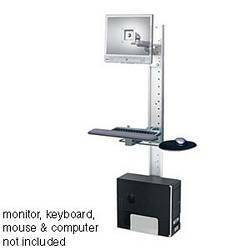 Designed to hold all the components of a basic computer setup, the track system allows for significant adjustability while requiring only a minimum of space. Each of the components on the track system can be adjusted vertically. Kit includes 63" of track in 2 sections, LCD mount, keyboard and mouse tray, and PC case bracket. Includes mouse pad, wrist rest, three track transits and LCD-mounting hardware. Assembly required. Requires wall-mounting hardware. Monitor, PC & peripherals not included. Pros: High quality billet aluminum pieces, multiple adjustment points, clean looking, minimal footprint, built to last. The keyboard and mouse tray can be folded down when not in use. Cons: Installation suggest having a solid wall (concrete or brick) or having the wall reinforced with extra stud bracing or using a three quarter inch plywood backing inbetween the track and the sheetrock. The provided track mounting hardware is for use when mounting to concrete or brick only. Alternative mounting applications will require the purchase of washers and screws. Other Thoughts: I drilled it directly into a metal stud using all of the provided mounting holes (4 per track) and supported its weight at the bottom by having it flush with the floor. 5 out of 7 find this review helpful.